The Swedish language version of the classic comic book hero ‘The Phantom’ has been mocked by a Polish broadcaster after an issue was released of the superhero beating up “Polish nationalists” with a gay pride flag. 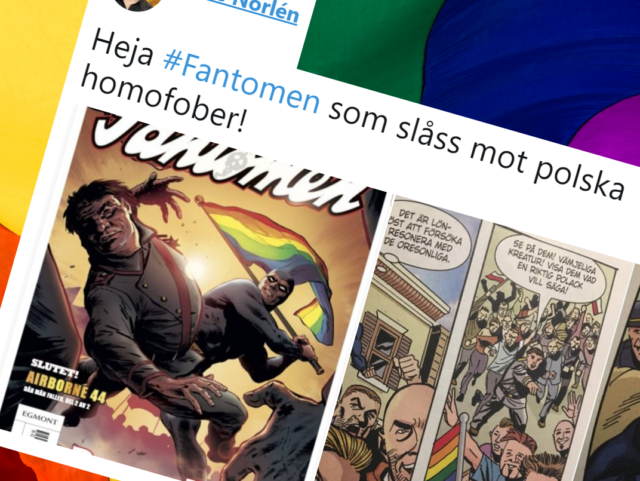 The story occurs in the latest issue of Sweden’s Fantomen magazine which sees the Phantom, a popular superhero in Sweden who was created by United States comic book artists in 1936, attend a gay pride parade in Warsaw and attack “Polish nationalists” who protest the event, Aftonbladet reports. Mikael Sol, editor of Fantomen, explained that the writer of the issue, Philip Madden, lives in Poland and based the story on trends he claimed to be going on inside the country. “I thought it became a nice symbolism with the colourful flag, which stands for tolerance, against the colourless grey dressed villain who stands for intolerance. I understand clearly that the cover is controversial, but sometimes you have to feel comfortable and stand safe in your choice,” Sol said. Sol said that he expected reactions to the issue and got one from Polish broadcaster Telewizja Republika whose English-language programme Poland Daily mocked the comic book in a video posted on Twitter. The latest Swedish edition of the famous American cartoon "the Phantom" is stirring up emotions on social media. The writers have decided to send the superhero to Poland in order to defend a Gay Pride March against evil Polish nationalists. In the short clip, the presenter questions how the Polish nationalists are dressed like Confederate soldiers from the U.S. civil war and goes on to compare the new Phantom with the internet meme “Captain Sweden” which ridicules the overtly social justice policies of the Swedish government. Over the last several years, Sweden has implemented a number of social justice policies from feminist-inspired snow ploughing that caused major traffic problems in Stockholm in 2016, to proposing the inclusion of gender identity into hate crime legislation. Social justice ideology has also been directed toward children in Sweden in a number of cases, such as the library of Malmö inviting drag queens to read to local children and books on the subject of transgenderism, like Hästen & Husse being directed at toddlers and preschoolers. A report from last year claimed that the number of children in Sweden claiming to want to change their gender had increased 100 per cent every year over the last few years.